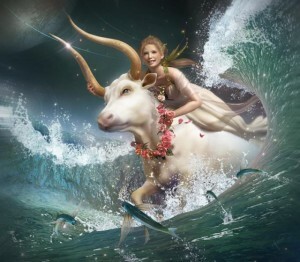 Venus entered its own sign of Taurus, the Bull, on March 28, 2012 and will remain there until July 31, 2012. During this time it will transition from Evening star to Morning star completing its fifth and final synodic cycle of its 8 year pentagonal dance. Taurus is a powerful sign for Venus as its earthy energy is able to manifest Venus' creative impulse on the physical plane. Venus in Taurus brings comfort and ease to life. But this Venus in Taurus must also go through the shamanic process of shifting from Evening Star to Morning Star. 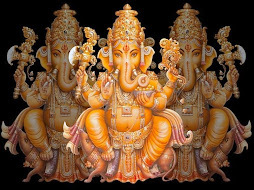 During its transit in Taurus there may be upsets in the status quo especially when Venus conjoins Ketu on April 9, 2012 and later becomes involved in a lunar eclipse on June 4, 2012 followed by its spectacular Venus Transit between June 5-6, 2012. Venus IS the planet to watch for the most significant astronomical and astrological events of 2012. The planet Venus has been referred to as the Morning Star or Evening Star for thousands of years. As its orbit is closer to the Sun than the Earth's, it can never stray very far from its source of luminosity. Its twinkling presence may grace either the eastern horizon in the pre-dawn sky, or the western horizon just after sunset; and is never seen during the night. At most it is visible for a few hours before disappearing into the radiance of the day or evening twilight. A Venus Cycle describes its retrograde patterns that bring the planet into what's called combustion with the Sun. During this time Venus disappears from view on the earth for approximately 40 days. As I have discussed in many previous posts (click here and here), ancient sky-watching cultures interpreted the periods of darkness when Venus disappears from view on the earth as a time when the "star" traveled to the the underworld. Mesoamericans linked the Morning phase of Venus with Quetzalcoatl and the Evening Star with his twin brother Xolotl. The Greeks called the morning star phase Phosphoros meaning "Bringer of Light," or Eosphoros, "Bringer of Dawn,” and the evening star phase was called Hesperos meaning "setting in the West." The ancient Babylonians called Venus the double-phased Ishtar -- the Morning Star of War and the Evening Star of Love. 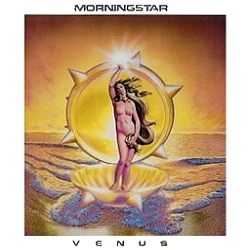 As Morning Star Venus was often represented as a bearded warrior bearing weapons. However, as an Evening Star the archetype shifts and becomes softer, more attuned to reconciliation, treaties, bringing communication and cooperation to whatever it is uniting. 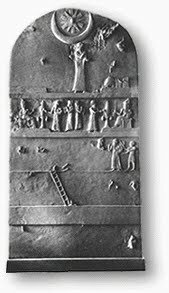 Some of the earliest references to Venus are found on clay tablets dating as early as 3000 BC from Uruk, an important early Sumerian city in southern Iraq. In ancient Sumer the goddess Inanna was associated with the planet Venus and the Uruk tablets specify her celestial identity as Venus with the symbol of an eight-pointed star. There are hymns dedicated to Inanna that describe as her astral manifestation of the planet Venus. It is also believed that the myths about Inanna correspond with the movements of the planet Venus in the sky. Inanna's Decent to the Underworld (click here) explains how Inanna is able to descend into the netherworld, pass through a series of tests, and return to the earth by ascending to the heavens. The planet Venus appears to make a similar descent, setting in the West and then rising again in the East. And during her journey to the underworld, the goddess Inanna passes through seven gates removing an article of clothing at each gate until she is completely naked exposing her bright beauty to the darkest realms. As my partner Joseph poignantly reminded me: The clothing represents the constructs of our ego and aspects of our false self. It only feels like Hell if we are attached to our egos. By removing her clothes Innana strips down to her bare essence and is given the opportunity to connects to her true self. In order to exit the underworld, Inanna was required to select someone to leave behind in her place. Could this be her shadow? When Innana returned to her kingdom, she finds that her husband Dammuzi had showed no concern for her during her absence. Thus she sent her "unconscious" male aspect, or animus, down to the underworld in her place where he is beaten and gashed with axes. Could the two faces of the Sumerian Venus and cycles of Venus represent the shamanic process of dissolving the ego, anima, and animus to release the divine enlightened self? This year Venus makes this journey through the heart of the Sun in full view to the Earth during a rare Venus Transit in June. We will be able to symbolically witness the goddess remove 7 layers of clothing until she stands before us naked. Because Venus is powerful in the sign of Taurus, this revelation of her true nature should prove to be astonishing. However, because we are also in the middle of a solar maximum there may be plenty of shadows, such as sunspots, in her path. Should one of those sunspots emit a solar flare it would be possible for the coronal mass ejection (CME) from the Sun to brush past Venus and hit the Earth. In my opinion, this possible phenomenon could bring an increase threat for a world wide influenza (click here for more). Thus we should all keep a close eye on this event. 2012 is perhaps one of the most highly anticipated years of the modern era due to wild apocalyptic speculations concerning the end date of both the Mayan calendar and Terrence McKenna's Timewave Zero: the Winter Solstice on December 21, 2012. Most Mayan scholars dismiss the idea of cataclysmic events as depicted in the highly entertaining, but inaccurate movie called 2012, and a few like John Major Jenkins point to the astronomical alignment of the Winter Solstice with the Galactic Center suggesting that intergalactic waves of energy or information may bath the Earth and transform consciousness (for more see my previous post Understanding the End Dates of the Mayan Calendar). 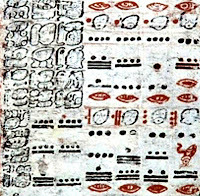 Moreover, there are no predictions of catastrophe in any extant Mayan texts. Timewave Zero, or Novelty, is a mathematical formula developed by psychonaut Terrence McKenna, who theorized that the universe has an evolutionary process of increasing interconnectedness that reaches a singularity of infinite complexity when everything will occur simultaneously. 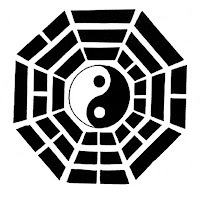 Based on his calculations using the King Wen I Ching, he believed that 2012 would be an "eschaton" in which a collapse of time would usher in a new time. It is very easy to see how these two concepts became "interconnected" over the years. What these two systems do share is the measurement of the fractal nature of time and mathematics related to the harmonic numbers of Venus cycles: 5, 8, and 13. In a previous post I described how Venus cycles relate to Phi and Fibonnaci sequences which are also found in the Mayan calendars. Venus orbits the Sun 13 times during the period in which the Earth orbits the Sun 8 times. As Venus orbits the Sun 13 times, while the Earth orbits the Sun 8 times, then Venus must pass the Earth 5 times during those 8 years completing 5 synodic periods in 8 years, or 5 complete morning star/eveningstar cycles that inscribe its mystical pentagram across the heavens. 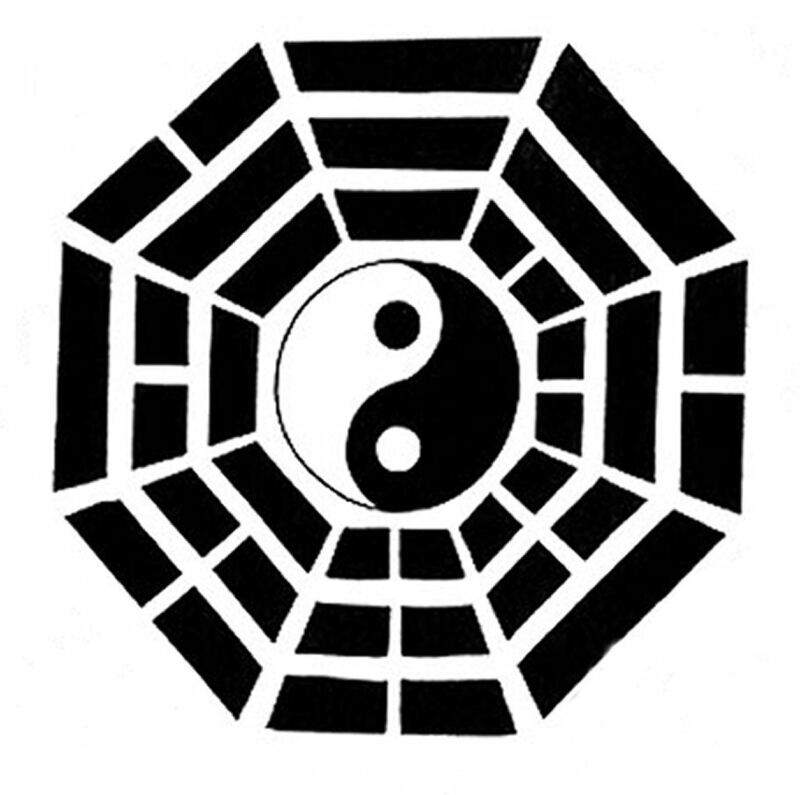 In the Taoist philosophy of the I Ching, the number 8 represents all possibilities in manifestation within the bagua and the forces of the phenomenal world. The 5 elements (which may more accurately be translated as 5 transitions) describe how these forces of nature, or energy waves, shifts within the lunar year of 13 moon cycles. In Mayan cosmology and mythology Venus was the focus of the timing of ritual. The ancient Maya tracked the Morningstar phases of Venus that occur every 584 days, with great accuracy. 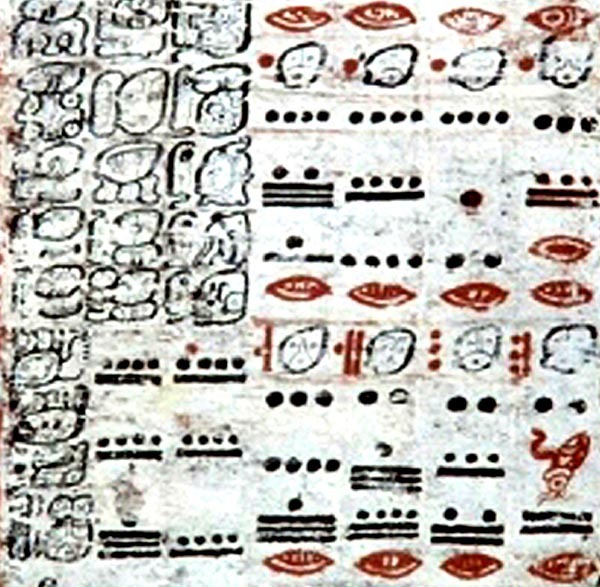 Within one of the few surviving Mayan books called the Dresden Codex, are six pages of Venus Tables that describe a Venus Round and the Sacred Day of Venus. 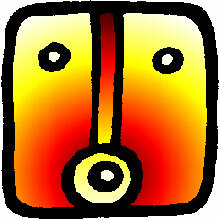 1 Ahau was the sacred Day of Venus for the Maya. 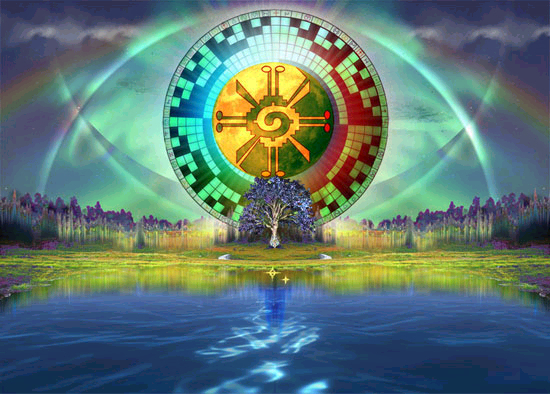 Ahau means "lord," "light" or "Sun" suggesting that a Venus cycle maybe connected with an inferior conjunction of Venus with the Sun, or even a rare Venus Transit of the Sun. I find the glyph of Ahau to be intriguing as it seems to represent the Sun emitting or being caught by a beam of light surrounded on either side with two dots, perhaps indicating the inner planets Mercury and Venus. Or these two dots could they represent the two phases of Venus that figure so prominently in Mayan lore. It may be a surprise to some, but not those who understand the concept of synchronicity, that Terrence McKenna was born on November 18, 1946 (7:30 am, Hotchkiss, CO), a day before an inferior conjunction of Venus in Scorpio/Vishaka ,which was in a configuration much like the upcoming inferior conjunction and Transit of Venus of June 2012, involving the south node, Ketu. I have no doubt that McKenna's natal line up of Sun, Venus Rx, Mercury Rx, Mars, and Ketu in Scorpio predisposed him to transcend ordinary consciousness through hallucinogens and navigate realities and consciousness that seem to be connected with Venus Cycles and Galactic and Universal Timewaves. 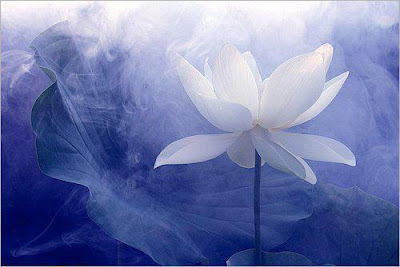 On December 21, 2012 transiting Venus will rejoin his natal Venus in Scorpio in a beautiful chance coincidence of time. Thus during 2012 the planet Venus is the certainly one to watch for the most significant astronomical and astrological events of the year: the Venus Transit. 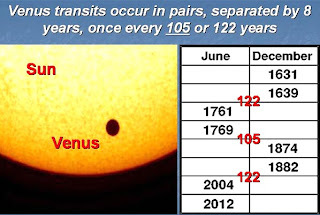 On June 5-6, 2012 Venus will make its astronomically rare transit across the face of the Sun appearing as a distinct black spot that is 1/32 of the diameter of the Sun. It will be large enough to see without the aid of a telescope. 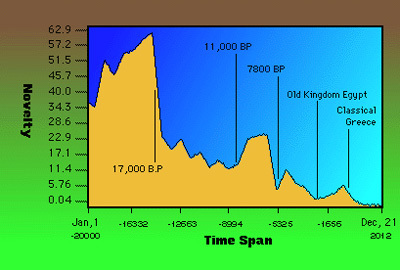 This phenomenon occurs in a pattern that repeats every 243 years, with pairs of transits eight years apart separated by long gaps of 121.5 years and 105.5 years. The periodicity is a reflection of the fact that the orbital periods of Earth and Venus are close to 8:13 and 243:395 resonances. The 2012 transit of Venus will begin a day after a partial Rahu lunar eclipse of a debilitated Moon in Scorpio/Jyestha with Ketu in Taurus/Rohini also "transiting" the Sun 11 degrees behind Venus. In addition Jupiter and Mercury will also be transiting the sign of Taurus, but will be hidden behind the rays of the Sun and unable to touch Venus with their direct glance. With so many planets connected with "consciousness" lined up and in combustion with the Sun, Venus is left alone to receive the Sun and Earth's full attention. As Venus passes between the Sun and the Earth during a Venus transit, it is in essence very similar to a lunar eclipse. So this time around we will be getting a double whammy of lunar and Venus eclipse. The involvement of the nodes, which are markers for incarnation into the material field, with this Venus Transit suggests that this astronomical moment in time will be quite significant. Because the south node, Ketu, will manifest its shadow the day before, it is the only planet that will have an effect on Venus. Its energy of dissolution may release old karmic patterns and materialistic bonds during the lunar eclipse which may then be transformed the next day by the conjunction of Venus in the heart of the Sun, called Cazimi. When the Sun engulfs the energies of a planet in Cazimi, (Venus), it is said to imbue the planet with the intensely positive and life-giving energy and power of the Sun, who draws its energy from the shakti of the nakshatras that it transits: Rohini. 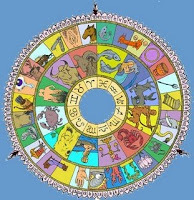 The previous Venus transit of 2004 also occurred in Taurus, but in the nakshatra of Mrigrashira which has a very different flavor than Rohini, also known as Surabhi - the celestial cow who is regarded as the source of all prosperity. The fixed star associated with Rohini is the great Persian royal star Aldebaran, the "watcher of the east," and its residing deity of Rohini is Prajapati, the Creator who grants our deepest desires. 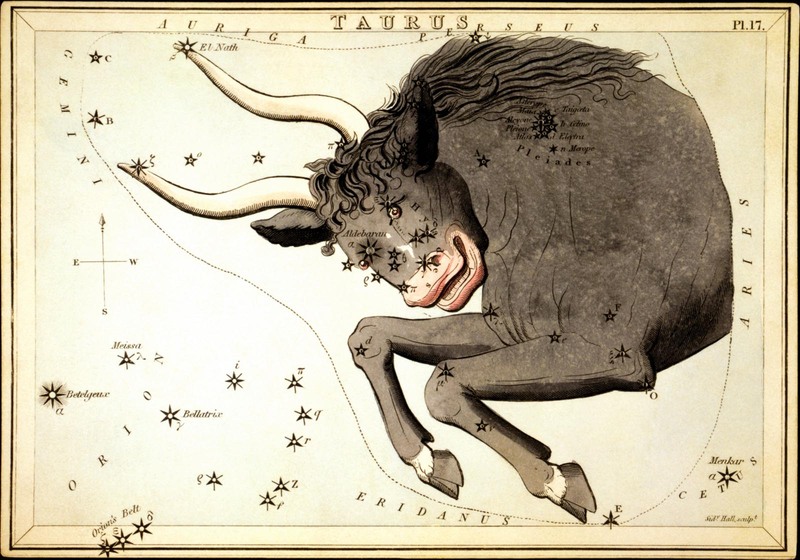 Aldebaran is located in the eye of the Bull and is thus associated with sight, illumination and vision. Brady believes that "this radiation of the Cosmic Bull implies that something will be destroyed or ruined, but then re-cosmogised, reborn, or remade afresh" which sounds very Mithraic to me. She predicts that there may be another European or global currency/market crisis representing a harvest being destroyed. "This is a time when the heavenly patterns are indicating cosmogising -- destroying to remake afresh." In the Vedic tradition, the power associated with this nakshatra is rohana shakti, growth -- as might be expressed in the Fibonacci sequence, phi, and the sacred geometry of the pentagram that Venus draws in the heavens over the course of 8 years. Rohini is also called the "star of ascent" that gives an increase in status in society, and perhaps to our souls. Thus this Venus Transit may instead herald a provocative shift in energy at that time in which we may be able to call upon the Creator and Universal forces for the star's gift of "ascension," be it material or spiritual, to be made manifest through Venus' shamanic transformation to Morning Star. Venus will remain in the Morning Star position through the end of the year, and travels to nearly the exact opposite side of the zodiac for the morning of the Winter Solstice, and completion of the Mayan Calendar in the nakshatra of Anuradha, whose symbols are the lotus and triumphal doorway. Where will our brave Venus lead us? That remains to be seen, but one this is for sure, Venus, the bringer of light, promises a beautiful dawn. Namaste! Venus is in Gemini in the tropical zodiac, but it is transiting Taurus in the sidereal zodiac which is astronomically more accurate.